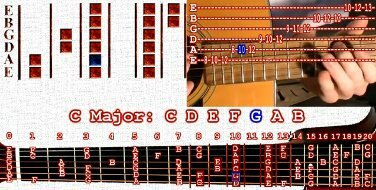 You can find videos like Understanding The Major Scale and How To Read Guitar Tab in that section. The Chat Room is a new feature I recently installed, it has video as well as audio capabilities so you can show off your guitar skills if you have a mic or a camera. he Mp3 Section is where I store various mp3s from the videos I make. I use YouTube to host my videos and some times the audio encoding is less than desirable. Feel free to download the mp3s I have available. The Games page doesn't have a lot of games right now so if anyone knows of any games I can add to my collection, let me know. I'm looking for games with a musical theme or anything educational. And finally the Resources Page is where you'll find useful things like the Metronome I created or Guitar Tuners you can use to keep your guitar in tune. The Metronome. I couldn't find a good metronome online to purchase or to practice with so I made this one. This metronome has 4 different beats you can choose from: Beat 1 - is just a high hat cymbal on every beat without any accents. Beat 2 - has a snare hit on the 4th beat and a kick drum on the 2nd. Beat 3 has an accent on every 3rd beat. Beat 4 - is my personal favorite, it's just like Beat 1 but instead of a kick drum and a snare it uses what sounds like stomping feet and hand clapping. The beats per minute can be set from 50 to 250 beats per minute. So go ahead practice a scale or an arpeggio with the help of this Free Online Metronome. Before the metronome I uploaded a video guitar lesson on The Major Scale. This video covers some pretty basic principles like what a half step and a whole step are, how to play a Major Scale across all 6 strings, how to figure out the notes in any major scale using the formula: WWhWWWh. This video will also show you how to move a specific 'pattern' around on the guitar in order to play major scales. This way you do not need to calculate whole steps and half steps. Click on the image to go to the Major Scale web page. I've also typed out the monologue of the video and included helpful images if you prefer learning that way. If you are going to learn anything from the videos you will need to know how to read guitar tablature. If you don't already know how to read guitar tablature or tab as it is called, check out this video: How To Read Guitar Tab. If you already know a thing or two about reading guitar tab check out the Guitar Tab Videos page. The most popular tab video here is by far the Simplified Super Mario Bros guitar tab. I also figured out an Advanced Super Mario Bros guitar tab which requires finger picking (No Pick Involved) and that version includes the melody that plays when Mario grabs the flag at the end of each level. If you want to hear the original nintendo video game music from the Super Mario Bros Game. You can play the original game here.